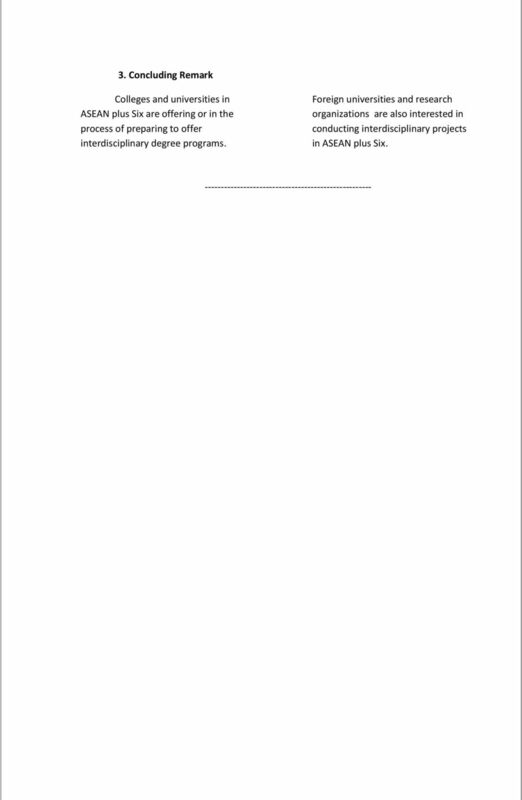 Download "Interdisciplinary Degree Programs in ASEAN Plus Six Countries"
1 Interdisciplinary Degree Programs in ASEAN Plus Six Countries Prof.Dr. Srisakdi Charmonman Pornphisud Mongkhovanit Abstract Nowadays important problems cannot be solved by using only one discipline of knowledge. Therefore, experts from several fields have to cooperate in order to figure out the solutions for the problems. This paper discusses the ASEAN and six countries in Asia Pacific rim, so ASEAN plus Six are gaining recognition. They are Brunei, Cambodia, Indonesia, Laos, Malaysia, Myanmar, Philippines, Singapore, Thailand, Vietnam. and Six countries are Australia, China, India, Japan, New Zealand, and South Korea. 1. Introduction Nowadays important problems cannot be solved by using only one discipline of knowledge. Therefore, experts from several fields have to cooperate in order to figure out the solutions for the problems. Popularity of Interdisciplinary Degree Programs occurs. Searching Google with a phase Popularity of Interdisciplinary Degree Programs, over 1.5 million entries were found. 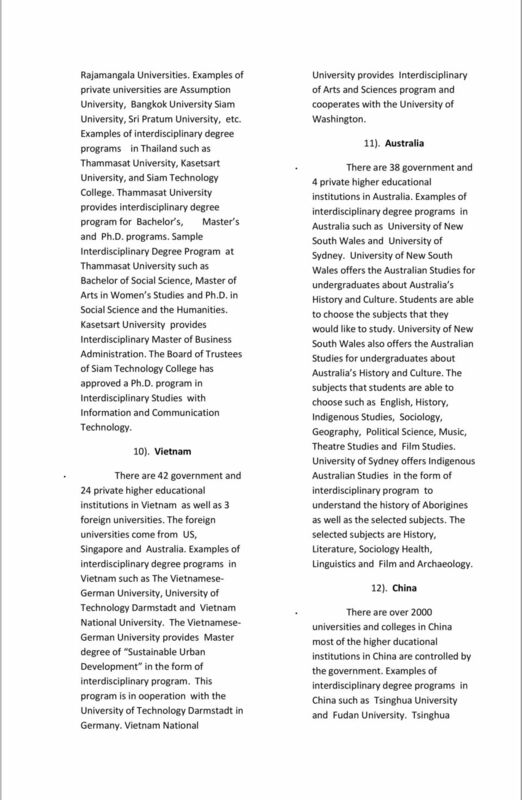 This paper discusses the 16 countries; ASEAN and six countries have been joining the interdisciplinary degree programs, so ASEAN plus six countries are gaining recognition. ASEAN has ten countries, they are Brunei, Cambodia, Indonesia, Laos, Malaysia, Myanmar, Philippines, Singapore, Thailand, Vietnam and six supporting countries are Australia, China, India, Japan, New Zealand, and South Korea. 2. interdisciplinary Degree Programs in each country 1). Brunei There are 13 government and 6 private universities and colleges in Brunei. A few of them use the word university. 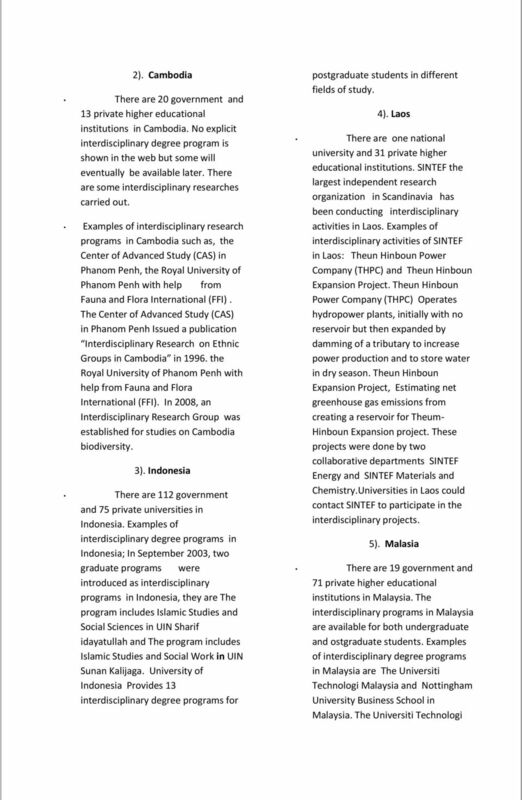 Examples of Brunei: Sultan Sharif Ali Islamic University and Seri Begawan Religious Teachers University College, No explicit interdisciplinary degree program is shown in the web. On 30 March 2013, three top-ranking Japanese universities agreed to cooperate with the University of Brunei Darussalam to deepen ties in joint research and faculty exchange. The three Japanese universities are; Doshisha University, Sophia University and University of Tokyo. This development in cooperation might result in interdisciplinary studies in the future. 5 University has an Institute of Interdisciplinary School of Health Sciences for both graduates and undergraduates. Fudan University runs in the School of Management, it provides the interdisciplinary program for undergraduates called all-round education. 13). India There are 285 state and 112 private universities in India. Examples of interdisciplinary degree programs in India such as University of Pune and University of Mumbai. University of Pune has Interdisciplinary School of Health Sciences. University of Mumbai offers Interdisciplinary study of Music and Psychology, Music and Sociology and Music, Philosophy and Religion for students who would like to improve their understanding and mechanism in the musical performance. 14). Japan There are 89 public and 580 private universities in Japan. 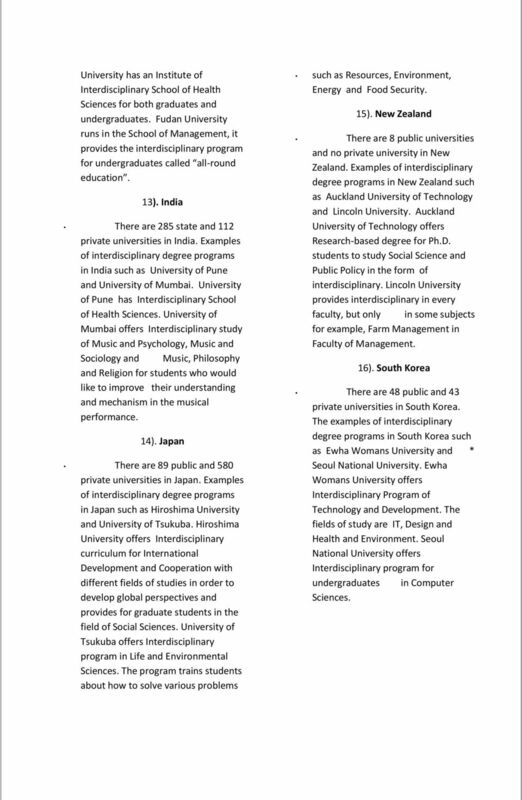 Examples of interdisciplinary degree programs in Japan such as Hiroshima University and University of Tsukuba. Hiroshima University offers Interdisciplinary curriculum for International Development and Cooperation with different fields of studies in order to develop global perspectives and provides for graduate students in the field of Social Sciences. University of Tsukuba offers Interdisciplinary program in Life and Environmental Sciences. The program trains students about how to solve various problems such as Resources, Environment, Energy and Food Security. 15). New Zealand There are 8 public universities and no private university in New Zealand. Examples of interdisciplinary degree programs in New Zealand such as Auckland University of Technology and Lincoln University. Auckland University of Technology offers Research-based degree for Ph.D. students to study Social Science and Public Policy in the form of interdisciplinary. Lincoln University provides interdisciplinary in every faculty, but only in some subjects for example, Farm Management in Faculty of Management. 16). South Korea There are 48 public and 43 private universities in South Korea. The examples of interdisciplinary degree programs in South Korea such as Ewha Womans University and * Seoul National University. Ewha Womans University offers Interdisciplinary Program of Technology and Development. The fields of study are IT, Design and Health and Environment. Seoul National University offers Interdisciplinary program for undergraduates in Computer Sciences.